This research and development platform would provide technological services and smart manufacturing solutions to Foxconn Group with a vision to integrate and incorporate cloud computing, mobile devices, IoT, big data, AI, network transmission, and automated robotics with 8K+5G, Foxconn shall setup this research initiative in collaboration with the academic and industrial ecosystem in India with Hyderabad as its base. 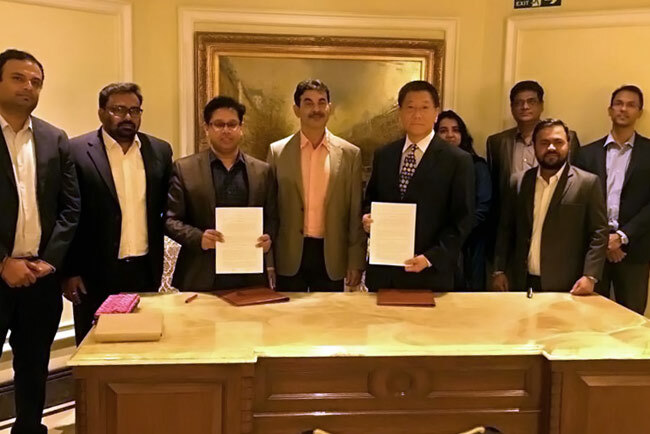 The agreement to setup this center was signed by Michael Yang, Director of Business Development, Chairman’s office, Hon Hai, and Sujai Karampuri, Director of Electronics, Government of Telangana. Mr. Jayesh Ranjan, Principal Secretary to the Government of Telangana, welcomed the initiative of Foxconn Industrial Internet Co. Ltd. (FII) and said that Hyderabad shall now also become the global hub for Industrial AI and Industrial IoT with it’s proven available academic and technology talent pool together with Academia and Industry support. The Electronics Wing of ITE&C Department, Government of Telangana is committed to developing, sustaining and maintaining Telangana as a forerunner in the field of Information Technology and Electronics. Further, the ITE&C Department is responsible for promotion in the Information Technology, Electronics & Communication industry in terms of providing communications network, carrying out Digital India initiatives, providing IT Solutions frameworks for other Departments of the Government of Telangana.